Probably my favorite day of the year, the day we spring-forward, it is Daylight-Savings Time. It signifies Spring is here and Summer is on it's way! 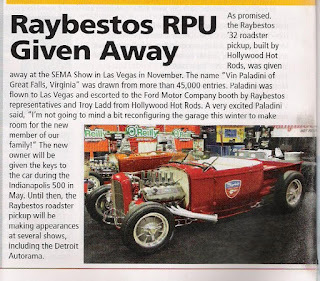 Just in case you've never seen a picture of the roadster... I got Daytons out for a couple of photos of it outside with the big-fat tires on before I took them off again. I really shouldn't drive on them. One; because they are irreplaceable. Two; they are somewhat brittle in there old age. And Three; they are literally like steam rollers --adding over a foot of width to the car! Now that may not be a big deal to some people, but when you are like me, it's a big deal. Winfield SU-1R V8 camshaft, as seen under the distributor. 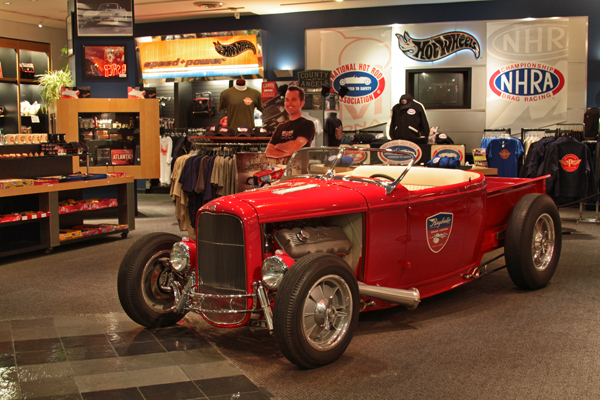 Ed Winfield was has been labeled as "...the father of hot rodding and its first prodigy." Born north of Los Angeles in 1901, Edward and his younger brother, William (better known as Bud, developer of the famed Novi racing engine), began hot rodding early. At age 11, Winfield had stripped down a Model T--on the market for less than four years at that point--in search of higher speeds. 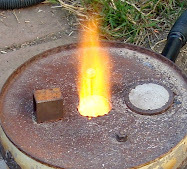 A year later, he began grinding his own camshafts for motorcycle engines. At age 14 he Ed was working for Offenhauser, building carburetors for racing engines. By 18, he had already built his own camshaft grinder and was in business regrinding his own go-fast cam designs for Model Ts. In 1924 Winfield Carburetor Company was formed to build, market, and sell the carburetor designs, and Winfield carburetors soon dominated Indianapolis 500 racing. Pete DePaolo's Duesenberg won the race in 1925 using two of the carburetors, and by 1930, all but one entry in the race used a Winfield carburetor. Winfield continued to experiment with fuel systems and engines, developing what's widely regarded as the first harmonic balancer, new carburetor designs, a continuous-flow fuel injection unit in 1934, along with overhead-valve heads and high-compression heads for Model T four-cylinders. He also continued to grind camshafts, mostly for race engines, until not long before he died in 1982. Portions taken from the an article that originally appeared in the December, 2008 issue of Hemmings Muscle Machines. 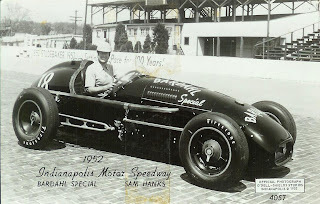 Sam Hanks, legendary racer and Indy Hall of Fame member, started racing midget cars as a teenager in the early 1930's. Moving on to Indy cars in 1949, he eventually won The Indianapolis 500, a dream fulfilled in 1957. Hanks, one of our first hot rodders, built his very own Offenhauser powered midget in 1935 and started winning soon after. Why my interest in this car? Well, it's got a lot of great looking parts right on the outside. Still on my suspension kick, I had to take some shots of hairpins & chrome. Left hand actuated clutch rod on the outside of the body. Also a the fuel pressure hand pump. I recognize the center water temp gauge as 1940's Stewart Warner, the other two gauges look older. The steering box is a Franklin. The steering wheel, a racing type which may have been made custom made and wrapped in rubber & tape. A common practice before racing wheels were marketed, was to make wheel out of a large circular saw blade. Cut spokes from the center & a rim. Then slit a hose to make a something to grip on to, and secure it with tape. Sam Hanks fought in WWII, before returned to racing and winning the AAA National Midget Championship in 1949.